New research shows most consider pay TV unaffordable and the big bundle a bad deal. They point at cost as the biggest problem, and with good reason. 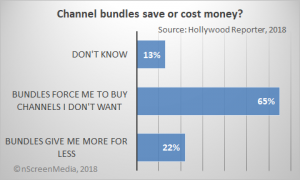 New research from the Hollywood Reporter shows that most U.S. adults consider cable or satellite TV to be unaffordable. Only 36% said that cable was affordable and 34% said the same of satellite. Streaming services get a thumbs up for affordability from over two-thirds of the survey group, with only 17% saying they are unaffordable. Certainly, the wide difference between pay TV and streaming TV has much to do with the price points of both. The average pay TV cost is $92 a month, while services like Netflix, Hulu, and HBO Now cost between $10 and $15 a month. If I were subscribing to a cable or satellite TV service, I would prefer to choose the exact channels to be included in my package. If I were subscribing to a cable or satellite TV service, I would prefer to choose from pre-set bundles of channels to be included in my package. 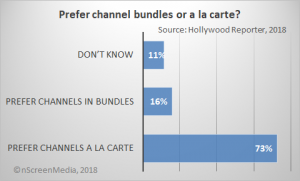 Nearly three-quarters of participants said they wanted to choose the channels included in their bundle. 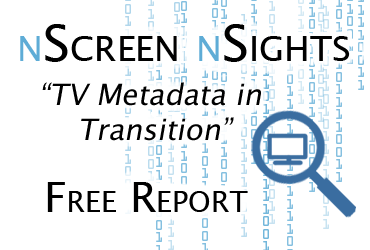 Television channel bundles mostly help consumers receive more channels at a lower cost. Television channel bundles mostly force consumers to pay for channels they don’t want. Two-thirds of respondents said they thought the channel bundle forced them to pay for channels they don’t want. 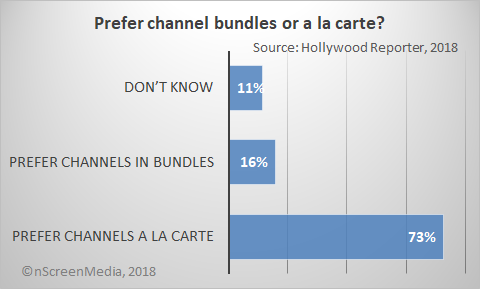 Only 22% saw the bundle as a way to get more for their money. There is no question pay TV has gotten less affordable over the last decade or so. Looking at Comcast data for the period 2009 through 2017, the increase in average revenue per unit (ARPU) has outstripped inflation in all but one year. *In some years, that difference is extreme. In 2015, ARPU increased by 4.2% while inflation was just 0.1%. Over the nine-year period, inflation averaged 1.5% per year while Comcast’s video ARPU increased by 3.5%. Comcast pay TV increased in cost 30% above inflation over the period. In other words, the average subscriber had to come up with $230 more in 2017 for pay TV after inflation than they paid in 2009. Moreover, for most of the nine-year period, the average salary in the US remained relatively unchanged. Pay TV subscription costs have been increasing above inflation for a decade or more. The continuous increases have eroded the value people see in the big bundle to such an extent that most now reject it. Lower priced streaming services with more focused content bundles are much more appealing to consumers. *ARPU is the average revenue Comcast receives for video services from each video subscriber.